We have facilitated two sessions on project success at BCS, The British Computer Society, in London. As should be the case for any facilitated discussion, the output depended on the participants, and was captured and shared with afterwards to attendees afterwards. By doing this we ensure that all learning was available to everyone involved in the event, providing added value. For a one-day event for your organisation, including your clients and your supply chain, with output to deliver success for all of you, please click here to contact us. Whatever we are working on, we always aim to provide supportive, constructive input. "... you're a very good panel member - quick response, concise, detailed, insightful. Many thanks, for this and many other things." How can I help you and your organisation? Board membership, strategic discussions, facilitated events to draw out the best in your team and to develop the best for your future. Please contact me for an informal discussion. BIM continues to engage nationally and internationally. Using data collaboratively in a trusting environment is at the heart of all good processes. Through the Institution of Civil Engineers BIM Action Group I am working with others on a paper for BIM in Asset Management. A key issue for all asset managers - including buidlings, rail infrastructure, ports, refineries, roads, bridges - is maximising efficiency and effectiveness for the long term. Engagement of asset managers and users during the formative stages of any project, whether new build or a redevelopment, refurbishment or maintenance is essential to this. While there are savings for initial design and construction, optimisation is best achieved through consideration of actual use and operational requirements in the early stages. This will ensure that the required data can be handed over to those responsible for effective and efficient use over the whole lifecycle. Building Information Modelling (BIM) is relevant to the whole of the property and asset ownership, design, construction and management supply chains, and was featured in Raconteur available in The Sunday Times, 14 June 2015. A webinar created with the Institution of Civil Engineers is available here, based on material I presented in Jordan in February 2015. To discuss how BIM can bring beneifts to you as client, property developer, owner. manager, contractor or suppliers please contact us. What is your corporate DNA? We work on Governance, as shown in this short video, and would be pleased to discuss governance with you. Our workshop on governance is designed to help people identify and address the key issues for their organisations. An intial day's workshop can provide valuable insights into the risks facing an organisation and ways in which the board and executive management can address them. Please click here to contact us for a preliminary discussion. 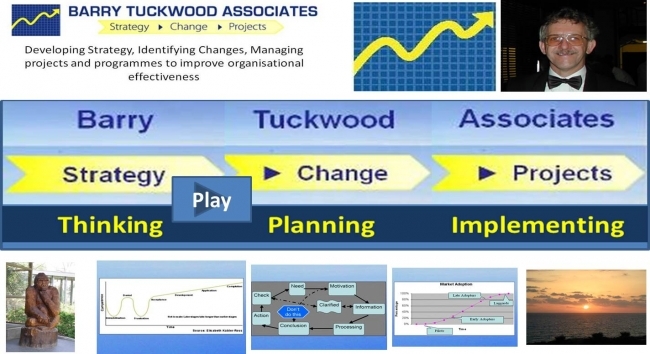 Barry Tuckwood is a business consultant working with people and organisations to create their strategy, select and manage projects and programmes, and include change management to improve their success. Barry also works on the delivery of MBA courses for Durham University Business School and is a member of the Information Systems Panel and the Building Information Modelling Action Group for the Institution of Civil Engineers. Strategic management is vital to all organisations. It is part of our work with Durham Univerity's MBA course, delivering it to students worldwide, introduced here. We would be happy to discuss how to support you and your company in developing and implemting your strategy. Please contact us. MORE VIDEOS OF OUR PROJECT AND CHANGE MANAGEMENT SERVICES ARE AVAILABLE THROUGH THE LINK BELOW.